Royal Personalization in the Workplace - What Would Kate Do? As admirers of Duchess Kate, we look to her for inspiration for outfits, hairstyles, and makeup. I often find myself thinking not only of the characteristics above but what she surrounds herself with as well. How does she seem so relaxed and in control? I am sure of the many reasons is due to the fact that she maintains control of her surroundings to the best extent possible. The Duchess strikes me as a planner and very organized. I have no doubt that she takes time to surround herself with beautiful items that reflect her personality which is an action we all can take regardless of our budget. With this in mind, allow me to take you on my own mini journey of self-discovery in the workplace with our Duchess as my inspiration. The last few months at work have been stressful for me. Many high priority items have come across my desk each day and I felt as though I were endlessly chasing my tail. I felt disorganized. To make matters worse, my desk wasn’t exactly inspiring. My main computer monitor is against a large backdrop. I am literally staring at a wall. Many experts will tell you that in order to be productive, you need to be inspired. I can tell you with certainty that the several boring pieces of paper I had tacked to my wall were everything but insightful. About a month or so ago I introduced to my desk this pretty little piece of art that my grandmother always had on her reading table. I like to think that she would sit down with her morning coffee and gaze at it. I decided to bring it into work so that I could look at it, too, when I drank my morning coffee. It took me a moment to find just the right spot but I felt it looked darling when peeking out from underneath my peace lily plant. From there, I began to wonder what the Duchess surrounds herself with. 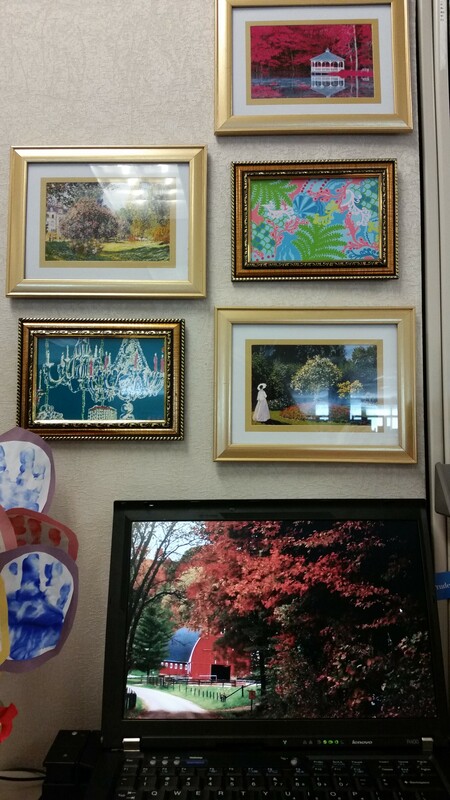 If she were seated at my desk, would she decorate it the same way? Would she have papers haphazardly tacked to a wall? Or would it be an organized, workable space with bits of personal reflection interspersed? A place where, when spending forty hours a week at, she could look forward to sitting there? Next, I bought some items to bring it all together and add some personal flair. 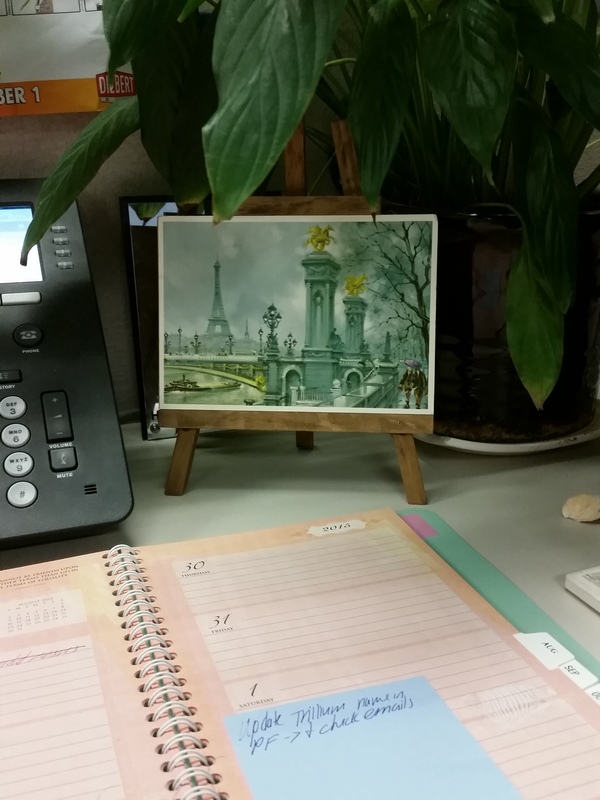 I bought a small gold easel to put my business cards and stationary on. I bought a pretty frame, placed a floral picture in it, and laid it down to act as a tray for my business cards and a small glittery pumpkin for a touch of decor. I bought pretty floral folders and got rid of the boring yellow ones to create an attractive display for papers always on my desk. I also purchased a small disk air freshener refill from Bath & Body Works and placed it under my small desk fan so that whenever it is turned on, it disperses a heavenly pecan pumpkin scent everywhere! Although I’m not done yet and plan to add a few other touches to “warm” up my desk, I am very pleased with its transformation in a week and a half. In fact, just yesterday a VP in the company I work for paused at my desk yesterday to comment on how nicely I decorated it! Another colleague also lingered a bit longer to comment on how “relaxed” my space felt and that when she is feeling stressed, she is going to come sit in my chair when I’m not there. I informed her the tea is in the second drawer down! I believe that the care we put into our surroundings defines the person we are and how we enjoy life. It’s important to take little actions to make a big impact on how you live. Whether it’s styling your desk to create an inviting atmosphere when you’re at work or taking a firm look at the surroundings of your home, it’s important that they reflect who you are. In moments of stress, you can find calm in your environment. I feel this is how Duchess Kate keeps her sanity and why she comes across as collected; it’s because she is. I think all of your ideas for your office are really good. They are creative, calming and inspiring. I’m a thrifty gal as well, unless I can’t find something I really want on sale. Then on occasion I have paid full price, but that is very seldom. Thank you for sharing all your ideas. Thank you so much for the kind reply and I’m so happy you’ve found it inspiring. Since I wrote this article, I’ve also bought a set of USB lights in “warm” (you can find them for about $10 on Amazon) to hook underneath my shelf to give off a focused glow. I definitely recommend them!